On November 24th, the holiday season kicked off with a bang as The Brian Setzer Orchestra put on a rocking extravaganza at the Wellmont Theater in Montclair, NJ. This was my first time seeing the BSO live in concert, and oh man am I glad I did! 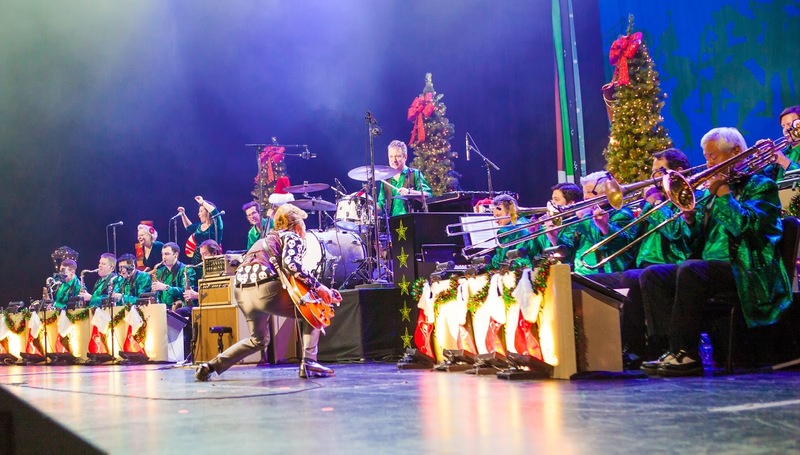 This night, Brian came with his musical elves and brought some holiday cheer to the NJ crowd. The stage was filled with Christmas trees, lights galore, and even a visit from jolly St Nick himself at the end of the show! 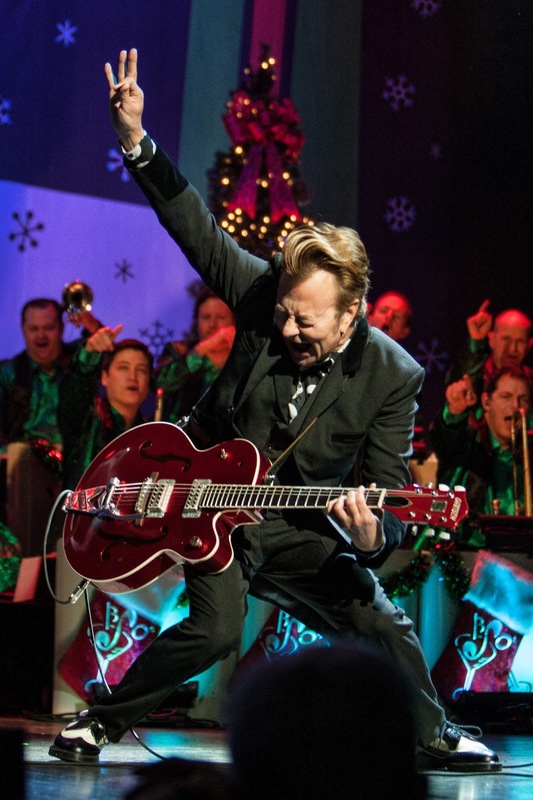 The show began with Andy Williams' "It's the Most Wonderful Time of the Year" playing throughout the theater as the band took the stage. Once the entire band got settled, Brian came out to a thunderous applause and then jumped right into a performance of "Pennsylvania 6-5000". I've always liked BSO's version of this classic hit, but I really enjoyed their live performance much better. It was the perfect song to set the energy of the show. From there on, the audience was treated to a performance filled with holiday classics and well known hits of the BSO through the years. Hard to imagine the BSO has been doing this for 25 years. And yet, they sounded as fresh as ever. I think most people can agree that Brian is a great guitarist. But hearing him live, you really can see that he is a legend on the guitar. He hasn't lost a step after all these years as he played each track so effortlessly. It's hard to pinpoint my favorite moments during the show, since there were so many. From beginning to end, there wasn't a dull moment. Some concerts you go to, there are moments that you mentally drift off during some of the parts that feel stale. But not this show. I was engaged the entire time. They went through the obvious classics like "Jump, Jive an' Wail!" and "Rock This Town", and even a nice cover of Tom Petty's "Runnin' Down A Dream", paying homage to Petty, who we lost way too soon. Things got real festive as they jumped into holiday songs like "Gloria in excelsis Deo", "The Christmas Song (Chestnuts Roasting on an Open Fire)", "Nutcracker Suite", and "Jingle Bells"! Overall, it was a night to remember and a real holiday treat for a NJ crowd that came for some holiday cheer! Definitely try to catch one of their shows during this tour!